Mac OS X 10.13, High Sierra / mac OS 10.12, Sierra / OS X 10.11, El Capitan / Yosemite, OS X 10.9, Mavericks / OS X 10.8, Mountain Lion, Mac OS X 10.6, Snow Leopard. This CSV contacts to VCF Mac converter tool is specifically developed for Mac users that's why it has MAC based GUI.The software has easy to operate features, all available in a single panel. Even a novice users can easily work with it. The CSV contacts to VCF converter for Mac gives option to map fields of contacts. CSV file column can be selected & mapped with vCard fields through available choices within software panel. The tool will save contact details in respective fields. The software for CSV contacts conversion to VCF works on Mac Operating System. The tool is embedded with GUI that makes it easy for users operate it for successful conversion. The solution to export CSV contacts Mac can be used by novice users. Mac CSV to vCard Converter offers "All Fields Mapping" option. If the check box for this facility in the tool is enable, it will automatically map all the fields from CSV to VCF file. This will save efforts of manually mapping the contacts from selected file to vCard on Mac. A CSV files stores data in tabular format, data can be in text or number format. Each record in CSV file is separated from each other by commas. A user can store user information or contacts information in CSV format, but file does not act as standard format file, hence user need to convert this format to standard contact file called vCard format. For that CSV to vCard on Mac OS can be installed by user. A vCard file format typically used to transfer contacts or business card between different devices and computers etc. Since user cannot directly move contacts stored in CSV or Excel file to Mac, for that another file format called vCard is used. A user needs to first Convert the Contacts saved in Comma Separated Value or CSV file into a vCard format, the user can view the contacts and other information of the user on their Mac devices. To test the tool for potential, its demo version can be downloaded free of cost on Mac machine. The freeware will allow exporting first 15 contacts from CSV to vCard or VCF files. How can I transfer CSV to vCard for Mac devices? Within few clicks, you are able to view the Output vCard file, for that user need to Download and Launch CSV to vCard mac converter on Mac supported OS X.
Browse the input CSV File. Select the Desitination Path to Save File. Match Contacts fields of CSV to vCard attributes. Select Export CSV to vcard option. View the Output vCard File within Mac system. How many contacts can I convert at a time from CSV to vCard? Migrate multiple contacts from selected Comma Separated Vale (CSV) file. However, at a time, only one file can be added with multiple contacts within CSV to vCard for Mac. I want to import CSV to Outlook Mac. How can I import VCF to Outlook Mac? Once the contacts in CSV file are converted into the VCF files, they can be imported into Outlook 2011 using the following steps. In Outlook 2011, click on "Contacts". Select the vCard to be imported into Outlook 2011. Drag the VCF files and drop them to contacts items list. I have my contacts saved in Excel file. Can in convert them to vCard on Mac devices? Yes, the contacts in Excel XLS or XLSX file can be converted into VCF file format using the CSV to vCard Converter. You have to save the Excel file as CSV file format and add it to the tool for conversion in VCF Format. In what time I will Convert CSV Contacts to vCard files on Mac? 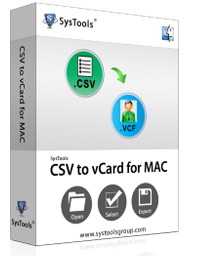 Try different CSV to VCF Mac online Converter but not satisfied with the resulted Output vCard file. Then downloaded the free demo versions to convert my Contacts of CSV to vCard format. Finally get the vCard format that can be easily used on the various application on mac. Best tool to convert contacts of CSV to vCard file format for Mac devices. Simple and Effective software to move contacts stored in CSV format as manual methods and online converter are not much effective. I just convert hundreds of user contacts stored in CSV format to vCard for Mac device within few clicks using the software. User-friendly interface help me a lot while conversion process of contact to vCard format.